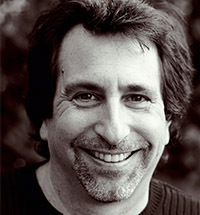 Raphael Cushnir is a leading voice in the world of emotional connection and present moment awareness. He has shared his unique approach to personal and professional development with millions of readers in O, The Oprah Magazine, Beliefnet, Spirituality and Health, Psychology Today, and The Huffington Post. He is the author of five books, gives keynote addresses worldwide, and is a faculty member of the Esalen Institute, the Kripalu Center for Yoga and Health, and the Omega Institute for Holistic Studies. In addition, he coaches individuals and teams at Fortune 100 companies, governments, religious organizations, and leading non-profits. 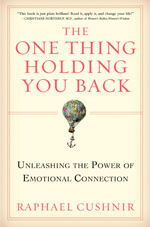 Cushnir's latest book, The One Thing Holding You Back: Unleashing the Power of Emotional Connection (HarperOne), brings together all of Cushnir's insights, principles, and practices regarding the realm of emotion and its key role in every form of well-being and success. It introduces the "2 X 2 Process" and its encapsulation as "emotional surfing." Cushnir's first book, Unconditional Bliss: Finding Happiness in the Face of Hardship (Quest), was nominated for the year 2000 Books for a Better Life Award. It introduced a simple yet profound process called Living the Questions. His second book, Setting Your Heart on Fire: Seven Invitations to Liberate Your Life (Broadway Books/Random House), was published in 2003 and is currently used as a major teaching text at spiritual centers around the U.S. The book's Seven Invitations comprise an invigorating, step-by-step process for reopening and reawakening even the most wounded of hearts. In 2005, Chronicle Books released How Now: 100 Ways to Celebrate the Present Moment. This gift book, with 20 full-color photographs and a highly accessible version of his core principles, quickly became Cushnir's best-seller. A companion card deck soon followed. How Now was chosen as one of the Best Spiritual Books of 2005 by Spirituality and Health Magazine. Cushnir's next book Surfing Your Inner Sea: Essential Lessons for Lasting Serenity (Chronicle Books) includes 18 brief, personal, and inspiring essays that introduce readers to Cushnir's life and teachings in a whole new way. Cushnir grew up in Northridge, a San Fernando Valley suburb. He entered college at the age of 16, attending the College of Creative Studies at the University of California, Santa Barbara, followed by Reed College and UCLA, where he graduated at the age of 19. After working his way through school as a teacher and a storyteller, Cushnir redirected his energies as an activist for the environment and human rights. He devised innovative media campaigns that included such celebrities as Madonna, Pearl Jam, Demi Moore, and Michael J. Fox. His passion for filmmaking led to a decade-long stint in Hollywood. He wrote, directed, and produced a Showtime movie, Sexual Healing, starring Helen Hunt, Anthony Edwards, and Jason Alexander. The film was nominated for two Cable Ace awards and won Grand Prize at the Houston Film Festival. Designed by Cushnir as a not-for-profit venture, it raised over $30,000 for the Minority AIDS Project. In 1996, both his career and his marriage fell apart. "It was a classic dark night of the soul," he remembers. "Many people experience something similar in their own lives. The particulars are always different but the essential experience is the same - a deep, depressing, gut-wrenching pain. In my case, everything I thought I knew about life went completely out the window." After a period, one of Cushnir's mentors convinced him to embrace the pain instead of turn away from it. He suggested that, in fact, this was a perfect opportunity to "wake up." Cushnir took his mentor's advice and ran with it. Over a decade later he's waking up still, one moment at a time. Helping others do the same has become his new life mission. "Raphael Cushnir gives us additional skills to help our clients experience more joy in life. 'Living the Questions' provides a framework for people to get clarity on feelings and the moment, and then possess the possibility of greater connection and even spiritual growth." "The Living the Questions' process outlined in Unconditional Bliss has been of great benefit to my clients. It helps them to feel their emotions, to own them, and to recognize both who they really are and what they're capable of becoming. I use the process personally as well. In addition to its practical aspect, I find that it has a profound spiritual component. It enables me to open more fully, go deeper, and transform." "Raphael Cushnir has provided us with a gentle tool that everyone can use. As clients practice his technique, they are able to climb out of the mind chatter and drop back into their hearts. A loving gift for all of us to utilize." "Many of us on the path of self-growth and transformation know that Self-Inquiry is THE tool and entering the Present is THE answer. Raphael's book delivers BOTH. Using his two (and only two questions) helps me wake up - fast and simple. Embedded in this book is a core awakening process that I enjoy practicing, and highly recommend to my clients. "You present your work with clarity and warmth. The people at the workshop found it, and your book, to be both powerful and helpful. "Raphael blends a mixture of warmth, humor, and compassion to teach his simple yet profound process. We thoroughly enjoyed his workshop and endorse it without hesitation." "Emotions are so often misunderstood. Raphael Cushnir shows us a how to connect with our our feelings and move past the obstacles that can block our way." "This is a wise, practical, and liberating book." "The One Thing Holding You Back is just plain brilliant! Read it, apply it, and change your life!" "Raphael Cushnir shows us the way to fulfillment and happiness in this brilliant new book. I'm confident you will learn something new from this fresh take on how to break through your personal barriers to reach your ultimate goals." "Raphael Cushnir gives readers dozens of practical tools to break through difficult emotions and make their dreams come true." "In this beautifully written and wise book, Raphael Cushnir spells out how resistance to emotions is often what gets in the way of our most important goals. Then, tenderly and patiently, he shows us exactly how to reconnect and break free." "This is a brilliant and important book. I recommend it for everyone - lay people and professionals." "The One Thing Holding You Back is a user's guide to our emotional lives. By combining powerful strategies, insights into the brain and wise reflection, Raphael Cushnir offers us a true breath of fresh air and freedom." "Cushnir (Unconditional Bliss) introduces fascinating and iconoclastic ideas about health and healing in this book, which argues that 'emotions are physical. Our bodies are the only places they can ever be found.' ... Emotions 'don't need to be felt forever, or obsessively, but just long enough to have their say,' contends Cushnir, who fleshes out his 'core concepts' with a welcome abundance of profiles; case studies of using his techniques to quit everything from cigarettes to sexual addiction, and practical tips and exercises."